I watch the news and I'm not sure if the 'white Christmas' thing is all its cracked up to be. It looks... cold, damn cold. I even feel it through my television. On the other side of the equator in Australia it's, well, unseasonably cold as well...but hey, you could put on a singlet and survive, for now at least. Anyhow, while Santa is gearing up and getting ready for his trek around, I would like to wish you, your family, your loved ones, your cats, your dogs or whatever you have, a very merry Christmas and a safe, happy and healthy 2011. I tried to fit as much as I could in one sentence because I meant it. Here's to a great year ahead! Cheers. Great image, Merry Christmas and a happy new year when it comes! 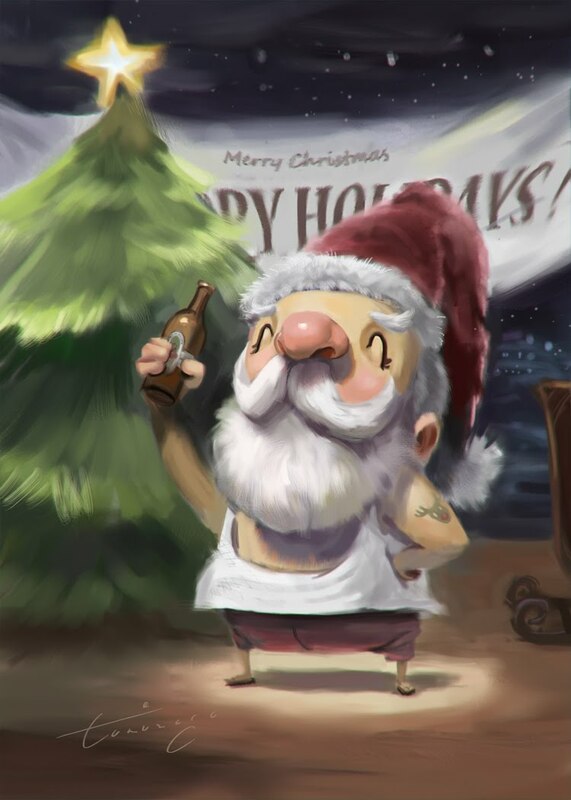 Wow, this is Australian Santa, holding a beer bottle and a raindeer tattoo. BTY,damn cold this summer. Snow in NSW, I can't believe it! How is Victoria? Wish you Merry Christmas and Happy New Year. And a happy Xmass & new year to you too! Merry Christmas to you, and yours Nori - great Santa too !! ... what's with the 'Happy Holidays' have we been towed across the Pacific !!! Have a great Christmas & Happy New Year, Nori! :) All the best for the year 2011!